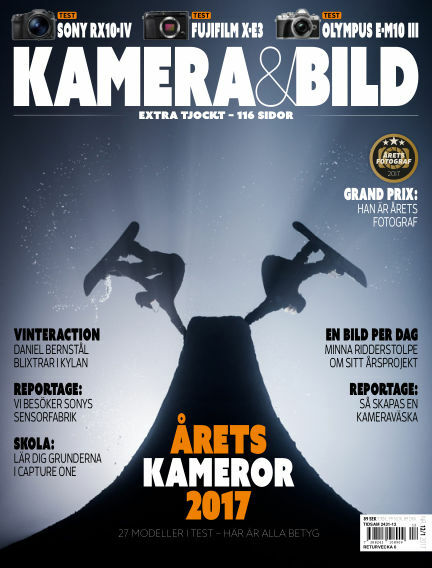 In this issue of Kamera & Bild : EXTRA TJOCKT DUBBELNUMMER – 116 sidor! TESTER: Fujifilm X-E3, Olympus OM-D E-M10 III, Sony RX10 MK4, Fujifilm XF 80mm F2,8 R LM OIS WR Macro & Olympus M.Zuiko Digital ED 45mm F1,2 Pro. REPORTAGE: Vi besöker Sonys sensorfabrik & Så skapade de en ny fotoryggsäck. GUIDE: Läs om året kameror. INTERVJUER: Martin Johansson, Minna Ridderstolpe & Daniel Bernstål. SKOLA: Grunderna i Capture One. FRÅGA JURISTEN: Vad gäller när kunden avbeställer? With Readly you can read Kamera & Bild (issue 2017-12-05) and thousands of other magazines on your tablet and smartphone. Get access to all with just one subscription. New releases and back issues – all included.